This entry was posted on March 2, 2011 at 5:27 pm and is filed under Author, Catton, Eleanor (2). You can follow any responses to this entry through the RSS 2.0 feed. You can leave a response, or trackback from your own site. I haven’t read this yet, but I actually have a different cover! Which I really like. So the covers have every bit as much a “wandering” history as the book itself. I really like the sound of this one. I enjoyed your description of the technique and the way the author creates an interplay between fact and imagination. While the (ostensible) subject matter may not have grabbed me, your praise of the writerly technique has. This is the sort of book I wish they included in the Tournament of Books. Kerry: I’m not sure how old your daughter is exactly, but I think that would add another dimension of interest for you. As the first quote in the review indicates, there are parents in the story (in both threads). And given Catton’s youth, the view of them comes more from the adolescent’s perspective than a “normal” adult one. 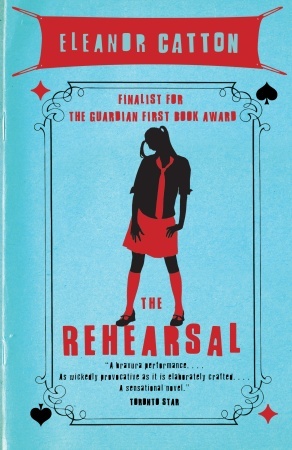 I didn’t want to cast this as an adolescent novel (because I found that interplay you mention more interesting) but that aspect is certainly present and may land with a parent more than it did with me. Certainly, for me The Rehearsal seemed better than a couple of somewhat similar novels that you have reviewed from the ToB list. I’ve seen so many mixed reviews of this book, I’ve tended to think it’s probably not for me. But your review has piqued my interest. It sounds like an accomplished piece of work. If she’s so ambitious with structure and technique now, imagine what she’ll be like with another book or two under her belt. Kim: I don’t think the book is totally successful — the story line is a bit thin (unless you happen to be under 25 — or a parent of an adolescent) and not all of Catton’s stylistic ventures work. On the other hand, I am inclined to give first novelists some slack and I did find the techniques she used to draw the two story lines together worked more often than not. Given that you are a writer/editor as I am, I suspect you would find that aspect of it interesting. How many times as a reporter when you were interviewing someone did you wonder just how much imagination the subject was using to fill in the gaps of what they were saying? There’s a lot of that on both sides here. Have to say I really loved – and was excited by – this one. Have my reading habits been totally warped by that Raymond Quesnel Exercises en Style in which the same (not very interesting) story is told 99 different ways? Perhaps. But just as I found it exciting when first John Hawkes and then John Irving ‘rewrote’ Ford Madox Ford’s The Good Soldier, I’m excited by an author like Catton who can reuse her own material within a single novel (much as Lionel Shriver reuses and repurposes events in The Post-Birthday World). And for someone so young to be doing this – well – I’m drooling in anticipation of her next book. Ruth: Your comment relates to Kimbofo’s preceding one. I think readers who find the novel wanting approach it too much from the point of view of the “story” that is being told (the cover blurb on my NZ version certainly points in that direction — wrongly, I would argue). It is the way that she shows how different people looking at the same lump of coal will come up with very different (arguably, all equally accurate) descriptions. And I certainly agree that this is exceptional writing talent from an author so young. This is not something which would immediately appeal to me, but obiously you found its qualities, and is perhaps a reminder to me to move away from familiar ground and to venture into pastures new.